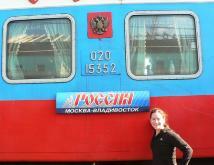 Posing with the train at one of the stops. Seeing Siberia from the train. 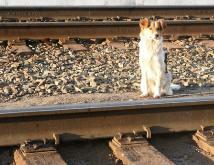 A dog hanging out on the tracks. time) so I think I am going to call it a night. very similar to ricotta cheese. So it is almost like I am eating blintzes. This is a good thing as I love blintzes. On my way back into the car, I asked our provodnista her name. It is Vera. a party like this in the past and it has always sounded like a great idea. such an impact, especially when traveling around the world (which we are all essentially doing). don’t think I am. Gosh darn it, I think all of these people here like me. door to chat with Jeanne and Nick. much more difficult than it sounds. to bring out in him…especially for such a mild-mannered guy! In the meantime, I am going to attempt to pronounce ‘t’s and not made them sound like ‘d’s. I just need to take baby steps. I am tired now. Learning can be draining. Time for bed. pull all-nighters. I am having a hard time bouncing back like I used to. non-fiction novel ‘Shantaram’ which I am looking forward to. In the meantime, are there really only fifteen hours left??? I am not ready for this train ride to be over. It feels like we just got on. Ohhhh….the chocolate was good! I have to report that the Russians make some tasty chocolate. Some addictions will never die. expense of missing out on some of the experience. A part of me says this out of envy; a bigger part of me truly feels this way. important things like where they were during huge events in world history and how they remember feeling at that very moment. scrapbooking…it was then that I realized that we both shared a love of traveling. tended to take the positive for granted. It’s the negative that made me really sit and think. begin to think of the trauma that she is going through. Geez…my mind sure is in a different state right now than it was in Hour 36. I actually like when my mind goes off on these tangents. may have died, the stories and memories of them have not. 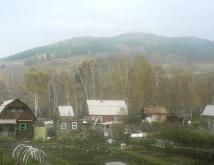 I have been looking out at Siberia for the past hour or so. I wish I had a song on my ipod geared towards traveling through this area. That would be cool. But I don’t. when I wake up the train ride is going to be over. It flew by so quickly. Too quickly. m not going to forget anything on-board.